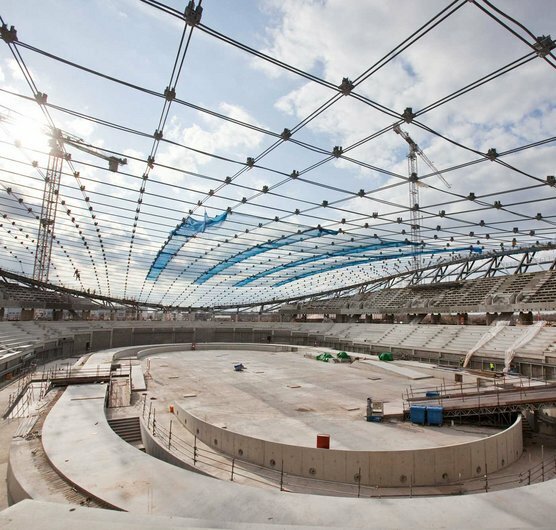 The construction team of the 6,000 seat Velodrome for 2012 has successfully tensioned the cable net roof structure and work can now commence on installing over 1,000 wooden panels which form the distinctive double curved roof. Olympic delivery Authority (ODA) Chief Executive David Higgins acknowledged the achievement, "The completion of this huge engineering challenge on the Velodrome follows the good progress we are making across the Olympic Park." Ed Clancy, Omnium Gold Medal Winner at the 2010 World Championships recently visited site and was impressed, "The Velodrome is already shaping up to be a fantastic venue and I can't wait to come back here to help Team GB continue our gold rush in 2012." Click here to watch the cable net being installed.